Make Custom Kitchens And Baths Pencil Out | 41 Lumber - Serving Iron Mountain and the U.P. But because some of the costliest line items in a custom project, particularly cabinets, are allocated to the kitchen and bath, budgets can quickly spin out of control. A critical part of the builder’s job is to educate clients, and a conversation about options, pricing, budgets, and allowances has to happen early on. “High-end cabinets like Poggenpohl, Poliform, or Siematic are budget busters,” says Washington, D.C., builder Jim Gibson. 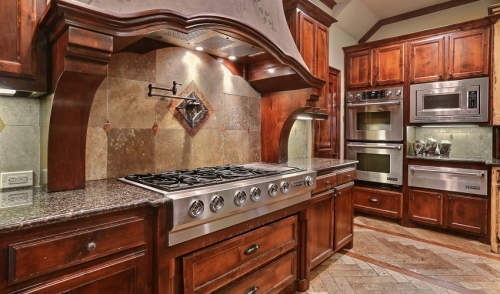 “I tell clients, ‘Those cabinets are going to cost you $100,000-plus. I offer a healthy allowance for kitchen cabinets: $60,000 to $70,000. If you want to exceed that, great, but we try to design for that number,’” Gibson says. Gibson Builders has amassed a large photo library that demonstrates the high quality and versatility of Heartwood’s work. This is often enough to convince clients that custom cabinets are the way to go. “They can do pretty much anything whether it’s stainless steel, wood, stain grade, or paint grade,” Gibson says. The turnaround is fast (for one recent project, Heartwood delivered finished cabinets in 8 to 10 weeks, compared with 12 to 14 weeks if they had been ordered through a retailer). The quality is consistently high, and Gibson typically saves 5 to 10 percent. Like Gibson, builder Rocky McCampbell of K Alan Co., Chapel Hill, N.C., prefers to use a custom cabinetmaker. “It results in a more aesthetically pleasing result, with less unsightly spacing between doors and minimal filler usage,” says McCampbell. “A custom cabinet shop usually can make better use of a provided space.” While cabinet manufacturers may have the advantage when certain finishes are desired, he prefers the flexibility of the custom approach. Typically, the process involves multiple meetings between (at minimum) the client, the cabinetmaker and the builder. Many times the architect and interior designer are also present. “In my opinion, the more minds, the better, with the requirement that egos be checked at the door,” he says.